The WiMN’s Front and Center is a weekly column that showcases accomplished women who work in the music and audio industries. We spotlight successful female performers, manufacturers, retailers, educators, managers, publicists, and everyone else in between. Want to be featured? Learn how here. These Canadian sisters have come a long way. From their country roots in Alberta, Canada straight through to EDM and now pop, Charlotte and Sarah Command are skilled writers and performers who have finally found the voice that feels right to them. With the release of their first single, “Low Profile,” the pair are all smiles. They finally have the opportunity to share their true passion with the world! Since the beginning of their career they’ve played iconic venues and events like Nashville’s famed Blue Bird Cafe, the Edmonton Folk Festival to a crowd of 20,000, Grey Cup Festival 2016, Canada’s Walk of Fame, a three year return to the Sundance Film Festival, an MTV private movie awards event, and six shows at the Shanghai International Arts Festival. 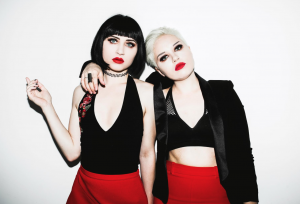 Both sisters began songwriting as teens. In 2011, they headed to Nashville, catching the ear of illustrious producer, David Malloy and his work partner, Scott Siman (long-time Tim McGraw manager), where the sisters were offered a publishing/production deal the first night after performing in music city. The submission of a song to the John Lennon Songwriting Contest won them an opportunity to perform at the NAMM Show, and the prestigious She Rocks Awards. In fact, Sarah is a 2017 She Rocks Award honoree. Their unique sound, lush harmonies and undeniable charm – on record and on stage – have turned heads internationally, earning the band multiple features in Guitar World, kudos from NME and opportunities including a tribute performance to Ronnie Spector at the 2017 She Rocks Awards in L.A. to a sold out crowd of 2,000, a performance for Chaka Khan at the 2016 She Rocks Awards, a spot at Yoko Ono’s Central Park Peace Sign Movement and show honoring John Lennon’s 75th birthday, and being chosen as Youth Ambassadors to meet Prince William and Princess Kate at a private function during their 2011 Canadian visit. We checked in with Sarah and Charlotte to talk about “Low Profile” and much more! WiMN: Tell us about your new single…what inspired it? Charlotte Command: Our new single, “Low Profile,” was actually inspired by a dream I had, during a very intense period in my life. The dream centered around a chaotic, tumultuous relationship that, metaphorically, never sees the sunlight because of a lover who’s very secretive. The next morning I sat down at the piano and the melody and lyrics fell into place. WiMN: Do you have any stories to share about the recording process? Sarah Command: It was a unique experience for us! The Disco Fries – a production duo that we recorded the project with – live in New York City and at that time we were living in Alberta, Canada. We recorded the vocals in our closet at home, and they produced/built the track around it in their studio in NYC. What’s amazing about the process is how collaborative it was. They really took the time to listen to our ideas and were able to capture the sound as we imagined it in our heads. WiMN: We understand it’s been a long road for you to release material..why? SC: We started singing together at a young age (6 and 9), and it grew organically into a career. We began performing country music, because growing up in Alberta there was a strong bluegrass/country music scene. It took us many years of writing everything from country, to folk to even topline for EDM, to eventually discover our individual sound; a sort of pop meets retro meets rock. Because we’ve been creating and performing together for over 10 years, we wanted to be sure that our first commercial release was 100% Command Sisters. We are very happy to say that we have finally figured out our creative voice and are excited to be sharing that! WiMN: We’re guessing there’s more where that came from…what can we expect in the future? SC: We are heading into the studio right away to record our debut EP, which will be out in the spring! More singles are going to follow “Low Profile,” which will be releasing early 2018. We’ve spent lots of nights brainstorming and dreaming about what it’ll look and sound like and we excited for the day we can share an entire album of our work. WiMN: You seem to play everything! Can you share a bit about your favorite gear? CC: For acoustic, we LOVE our Martin Guitars. They’ve been with us since we were kids. When Sarah wants to switch things up and go electric, she plays a PRS Guitar, the “Starla,” which she adores. I love Roland keys – they are my go-to for a great weighted feel that has all the right sounds to inspire me. WiMN: How does the creative process work for you? For example, what do you use to create scratch demos? CC: The creative process when writing is very spontaneous for me, as inspiration is so fluid and can spike like a lightning bolt from anywhere. When I’m creating a scratch demo of a new song I’ve written, I like to keep it simple. I use Logic Pro X to lay down vocals and slide in any sounds I may be hearing, to have a good reference before going into the actual session. WiMN: You’ve worked together for years…what’s it like working and creating with your sister? SC: We are truly yin and yang! This works great because when we sing together it sounds entirely different than if we were on our own. And it’s also a bonus that we live together…so rehearsing is easy to set up, haha! WiMN: You guys are so fashionable…does creating and maintaining an “image” ever get in the way..or do you feel it enhances you as an artist? CC: Thank you! Fashion for us is such a big part of the creative process and who we are as artists. Even though music is a sonic experience, whether people know it or not, it’s also a very visual one. When we write songs, we start to visualize the artwork, the music videos, and the colors that go with, which is how our style plays so much into the picture. WiMN: Have you ever encountered challenges as a young woman in the music business? SC: Age is constantly brought up. We cannot count the amount of times someone has warned us that “once you hit 25 in the pop industry, nobody will care about you or your music.” When we see strong women like Shirley Manson, Blondie, Fergie, Sia, and Shania Twain still killing it… we realize the falseness in this statement. The comment states that a women’s music career is solely reliant on her physicality, and that past the age of 25 they lose their attractiveness (which we all know, of course, is completely wrong). Regardless, we believe that no matter what you look like, or, no matter how big your Instagram is, it is still all about the music. We will keep writing and playing together until we’re old at empty open mics. Hopefully we’ll still be sporting the red lipstick! WiMN: What’s your favorite thing about being a performer? CC: My favorite thing about being a performer is finally getting to share the songs I write with an audience. The creative part is magical, but I don’t feel that true sense of purpose until I’ve put my thoughts out into the world. WiMN: What advice would you like to share with other young women who want a music career? CC: If I could share any advice with young people wanting to get into music, it would be to not shrug off your intuition for criticism coming from the wrong voices. People are going to try to tell you how to look and how to act, and who to be, but you should never let that get in the way of your own vision, especially if your gut tells you it doesn’t feel right. WiMN: Is there anything else we should know about the Command Sisters? SC: We’ve spent such a long time writing to find a sound that we felt like was our own and building a catalogue of work that we are proud of. It has felt like this lifelong journey that needed to be complete! We are excited to finally share this music with our friends and fans that have been incredibly awesome enough to wait and support us over the years. WiMN: What’s coming up for you? SC: If people want to stay updated on our next releases following “Low Profile,” they can follow us on @commandsisters across all platforms – particularly Instagram if they wanna become Insta friends!